Over the last five years, transgender people have seemed to burst into the public eye: Time declared 2014 a `trans tipping point', while American Vogue named 2015 `the year of trans visibility'. Over the last five years, transgender people have seemed to burst into the public eye: Time declared 2014 a `trans tipping point', while American Vogue named 2015 `the year of trans visibility'. From our television screens to the ballot box, transgender people have suddenly become part of the zeitgeist. This apparently overnight emergence, though, is just the latest stage in a long and varied history. The renown of Paris Lees and Hari Nef has its roots in the efforts of those who struggled for equality before them, but were met with indifference - and often outright hostility - from mainstream society. 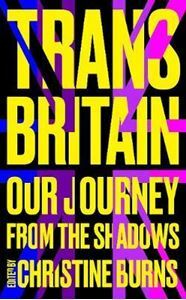 Trans Britain chronicles this journey in the words of those who were there to witness a marginalised community grow into the visible phenomenon we recognise today: activists, film-makers, broadcasters, parents, an actress, a rock musician and a priest, among many others. Here is everything you always wanted to know about the background of the trans community, but never knew how to ask. Much has been said and written about trans people by theologians and Church leaders, while little has been heard from trans Christians themselves.